Here are side-by-side video clips comparing a bunch of fire ants with different kinds of liquid. Fire ants use their claws to grip diverse surfaces, including each other. As a result of their mutual adhesion and large numbers, ant colonies flow like inanimate fluids. This film shows how ants behave similarly to the spreading of drops, the capillary rise of menisci, and gravity-driven flow down a wall. 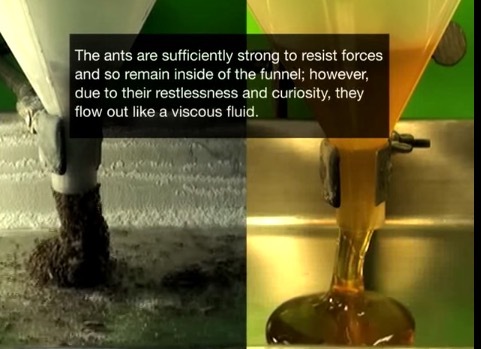 By emulating the flow of fluids, ant colonies can remain united under stressful conditions. Elizabeth Warren has proposed a $1.25 trillion plan to forgive student debts and make all public college and university undergraduate education free, as well as earmarking $50B for historically Black colleges, and expanding federal grants to help pay for all students' non-tuition expenses.